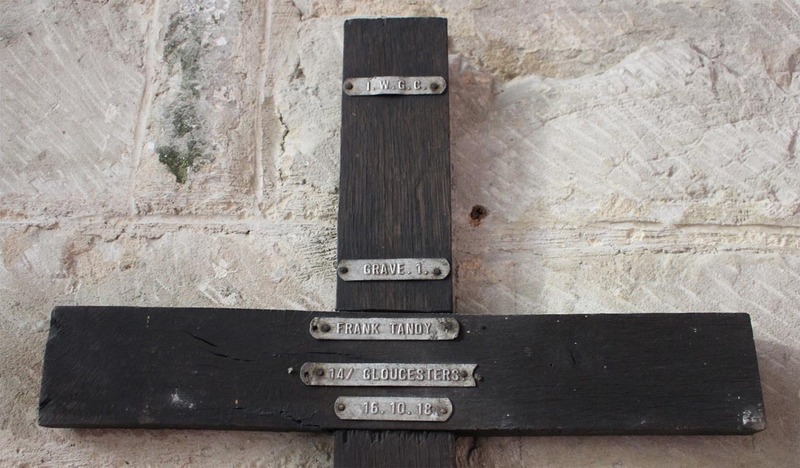 St. Peter’s Church, Flyford Flavell has two battlefield crosses, this one from WW1 and a second one from WW2. 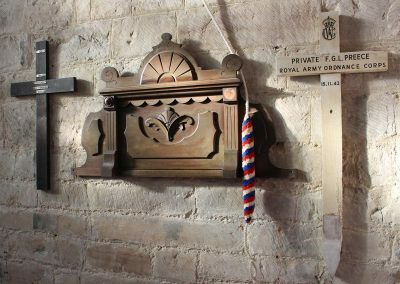 They are mounted on the north wall under the bell tower. 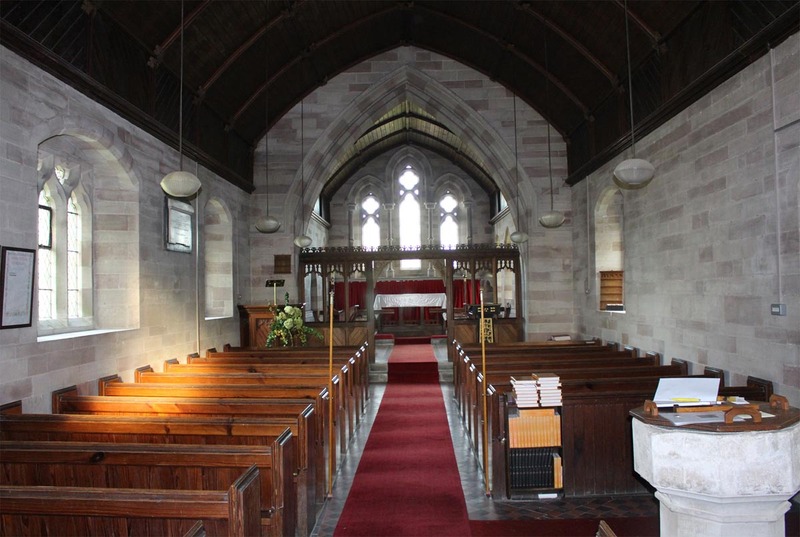 The church is usually locked, the key may be obtained from the house behind the village shop and post office (50m away) – which appears to be closed down now. The red ‘GPO’ phone kiosk outside the shop has been converted into a library. Mounting to wall: Fixed to wall with screws. Detailing: Plain cross with GRU tags only, no detailing. Evidence of use in field: Slight marking to base, under the stain. Surface insertion depth : None visible, possible cut off at base. Condition: Good condition, possibly a hard wood. Some splitting and warping around a knot on the cross beam. 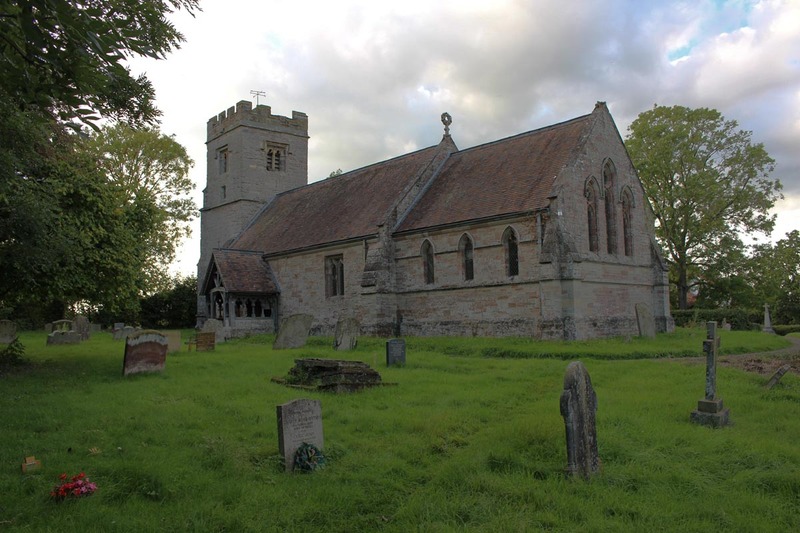 Additional Information: Son of James and Fanny Tandy, of Flyford Flavell, Worcester. In 1901, living at Flyford Flavell with parents James and Fanny M. Tandy. In 1911, as Frank Tandy, living as a lodger (cowman and garden lad), with the rector of Dormston and Kington. Medal records shows previous service no 1828 with 8th Bn. Worcestershire Regiment, which landed at Boulogne on 1st April 1915. 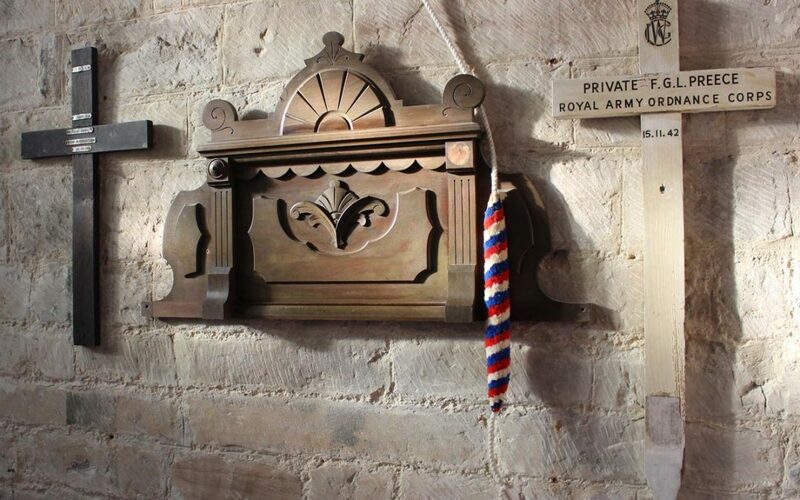 Gratuity payments and service number would indicate he volunteered or re-enlisted in August 1914. 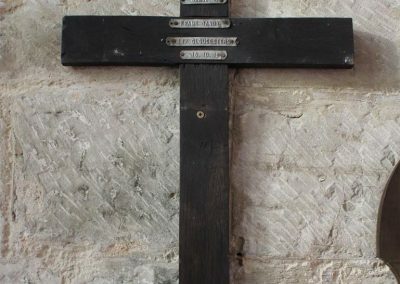 Commemorated on the War Memorial Cross in the church yard as Francis Tandy, this stone cross is rebuilt from a former cross which blew down in a gale. 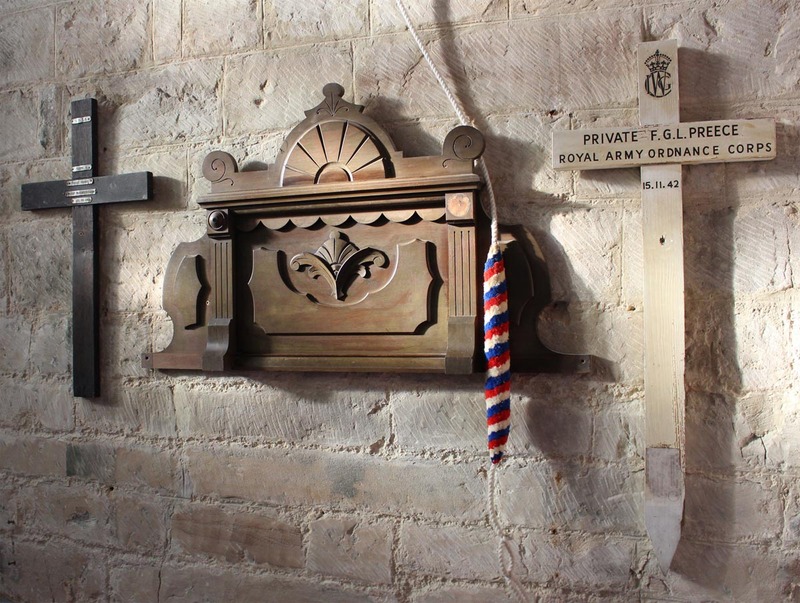 The church has a photo of the original memorial cross. Also commemorated on Flyford Flavell Council School Memorial, details at www.rememberthefallen.co.uk This style of oak memorial is a common feature in many Worcestershire Council schools. Text type: Black painted letters. Evidence of use in field: Aged paint. Pointed base has been refinished. Surface insertion depth: Difficult to tell, due to short section of base having been repainted. Finish: White paint, black letters. Original sign writers guide lines visible. Condition: Some paint cracked and flaking. Yellowing of paint. 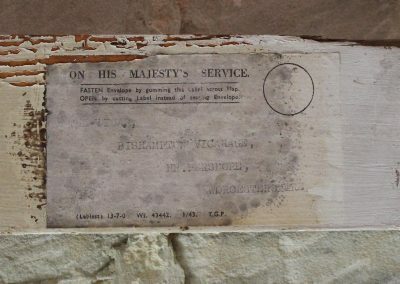 Has weathered ‘OHMS’ address label attached.. 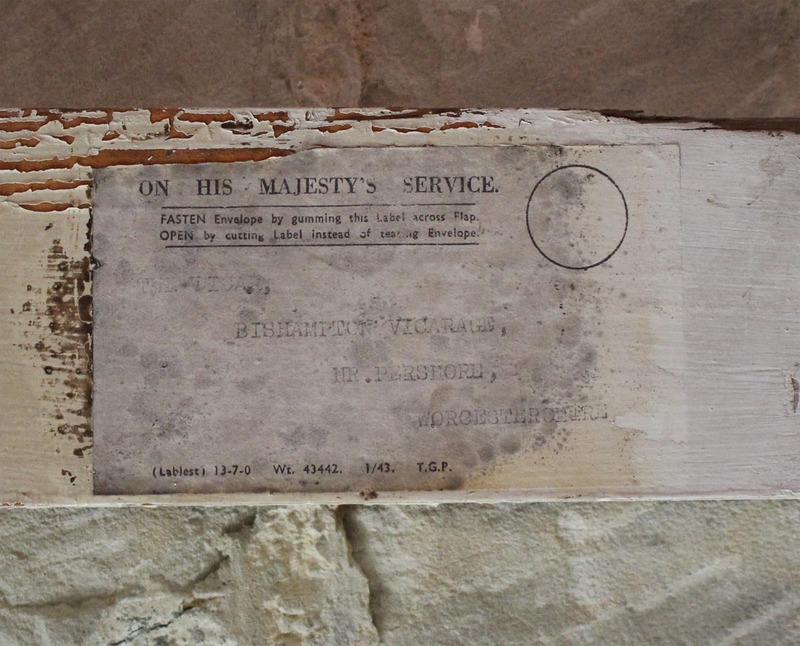 The OHMS address label has the address The Vicar, Bishampton Vicarage, Nr. 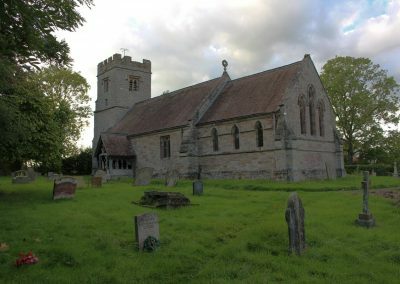 Pershore, Worcestershire. 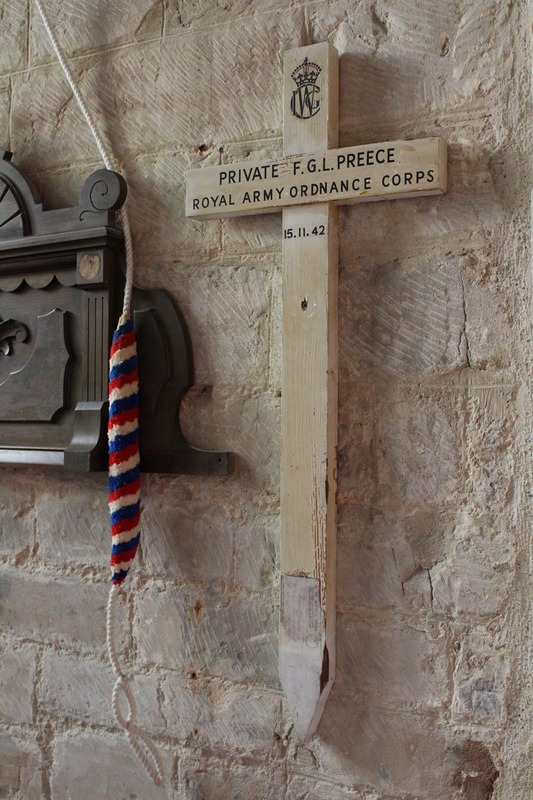 Pte Preece is buried in this churchyard, presumably the temporary grave marker was supplied by IWGC. 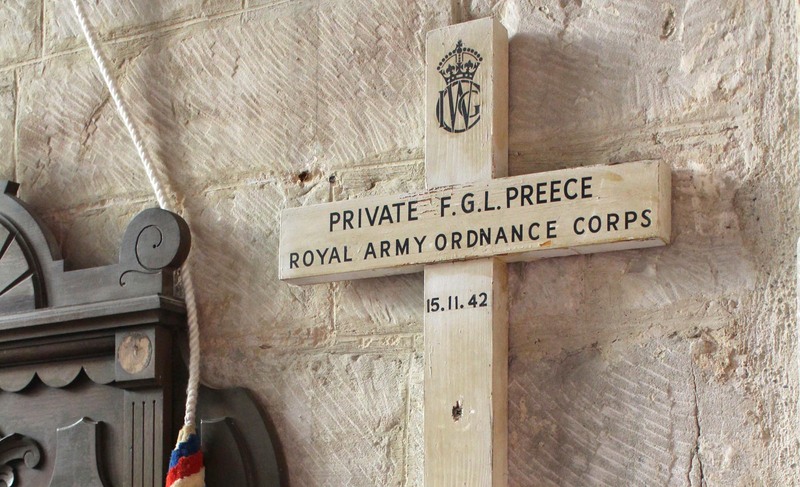 He is also Commemorated on the War Memorial Cross in the church yard, this stone cross is rebuilt from a former cross which blew down in a gale. 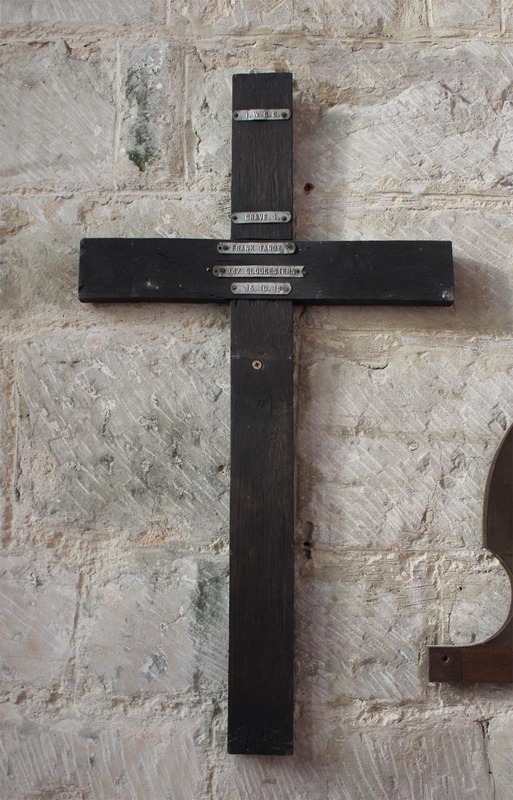 The church has a photo of the original memorial cross. 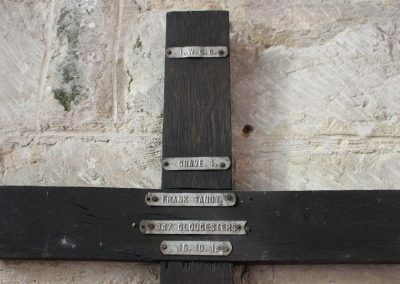 St. Peter’s Church, Flyford Flavell has two battlefield crosses, one from WW1 and a this one from WW2. 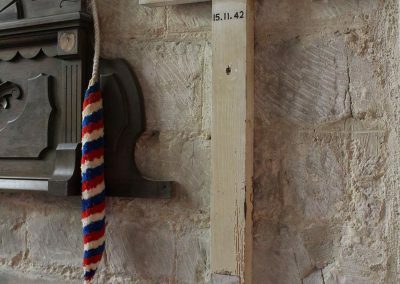 They are mounted on the north wall under the bell tower. 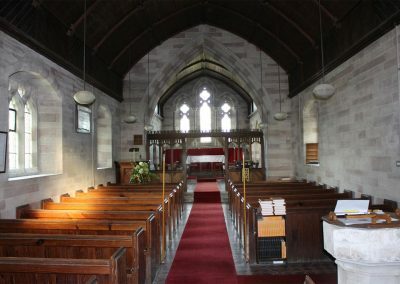 The church is usually locked, the key may be obtained from the house behind the village shop and post office (50m away) – which appears to be closed down now. The red ‘GPO’ phone kiosk outside the shop has been converted into a library. 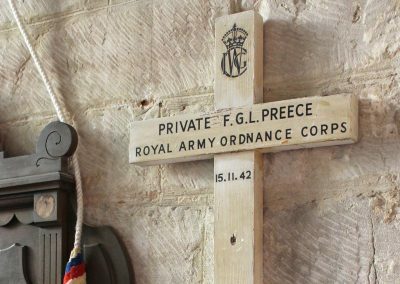 Additional Information: Son of Francis George Leonard Preece, D.C.M., and Ada Mabel Preece; husband of Barbara Mary Preece, of Tolladine, Worcester.